On April 16, 2010, Yiwu Kingdom Hotel held national five-star tourist hotel shingle listing ceremony, becoming the first five star luxury business hotel in central Zhejiang Province. Zhejiang Yiwu Kingdom Hotel is the first hotel constructed by the five-star hotel standard in this region. Since the opening in September 2003, Kingdom Hotel have received a number of national leaders, hosted many conferences and won a lot of praise. Yiwu Kingdom Hotel is located in city center,the most prosperous areas of Yiwu, adjacent to the bustling, lively and flourishing People’s square. It is close to the charming Xiuhu Lake and makes you enjoy a beautiful scenery when live in the hotel. At the same time,the traffic is very good. From the hotel to the International Commodity City is only 10 minutes by car and to Yiwu train station is 15 minutes by car. It is really convenient in transportation facilities and famous for elegant scenery. 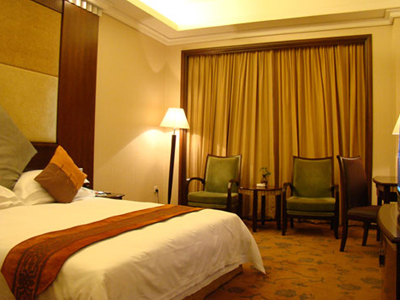 Yiwu Kingdom Hotel enjoys a luxurious design, warm and comfortable environment. The hotel has a dazzling display of various deluxe rooms and executive rooms 297 (sets). The interior design of these rooms are combined with Chinese traditional culture and modern culture essence. The rooms are fully equiped with modern facilities such as safe, mini bar, broadband network, and the International Satellite television etc.. Living in the hotel, you can view the broadness of hotel lobby, browse varieties of commodities in the shopping mall and enjoy the scenery both in and outside of Kingdom Hotel. The Chinese restaurant of the hotel is elegantly designed with more than 1800 seats, multi-functional conference hall and meeting rooms of various functions, bright and spacious, fully equipped to meet the needs of different types of meetings. Western restaurant and tea house are on the 22nd floor. In addition, the hotel has tennis courts, gym, chess room, sauna pool, beauty salon, surfing, swimming pool and other high level entertainment, making the guests enjoy a relaxed life.